The papers are from Prima - Epiphany - Striking Apperance. 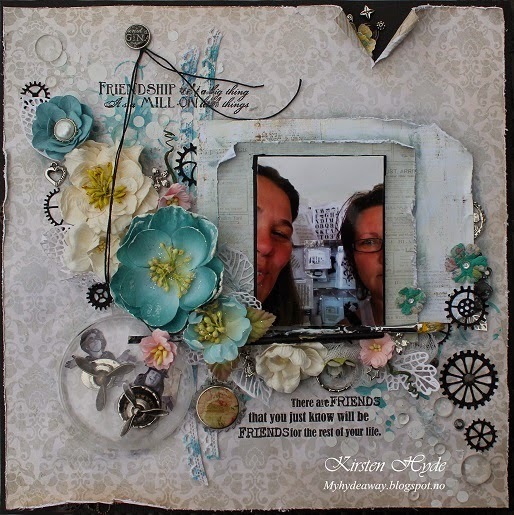 The background effects, have been created with distress ink and glimmer mist, together with stencils. 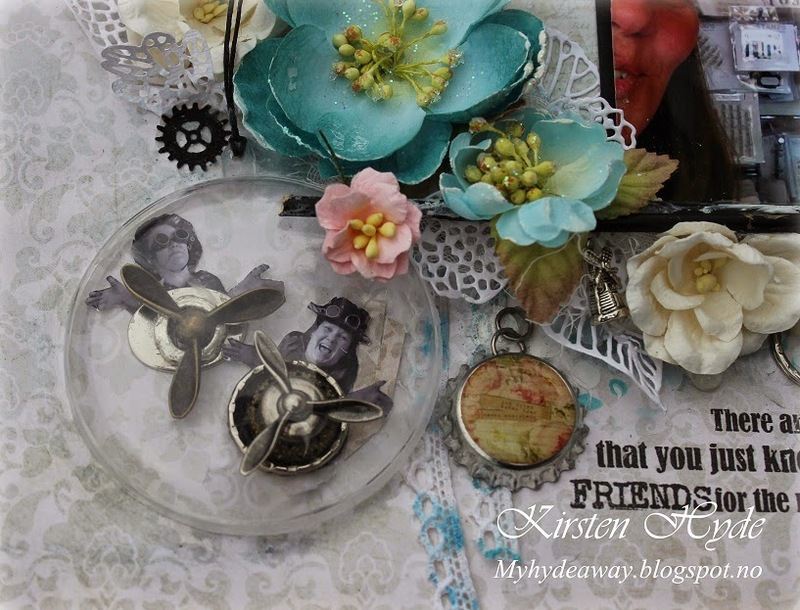 The doily dies are from Prima. Flowers are from Prima, Wild orchid and Petaloo (Peach - Botanica Blooms). The photo of the butterfly, is one of my own photos. 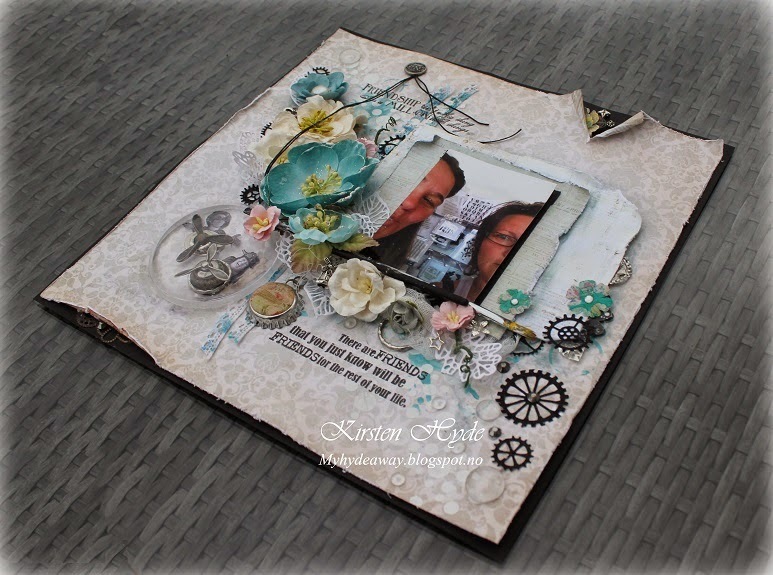 The gears are diecuts from Memory Box. 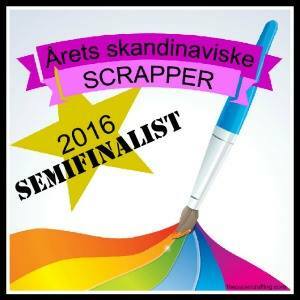 They have been cut in black glitter paper from Søstrene Grene. The stamps are from Indigo Blu, and the set is called B.F.F. 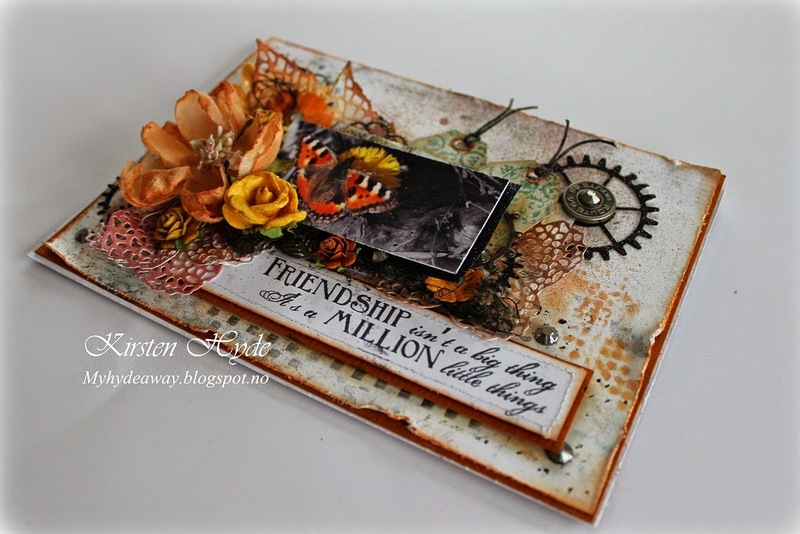 I wanted to make a layout with Prima's Build a Page sketch, for October. I found a really silly photo/ selfie of me and my best friend. The photo is from one of our shopping trips in a craft shop. So, since the photo isn't one of the best photos, but really funny, I thought I might as well do a crazy layout. 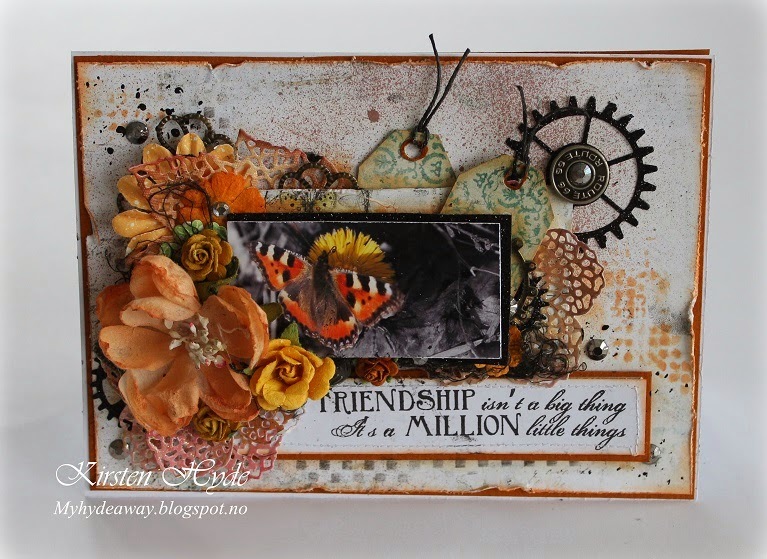 I have used some old Prima papers and a lot of different Prima flowers and embellishments. 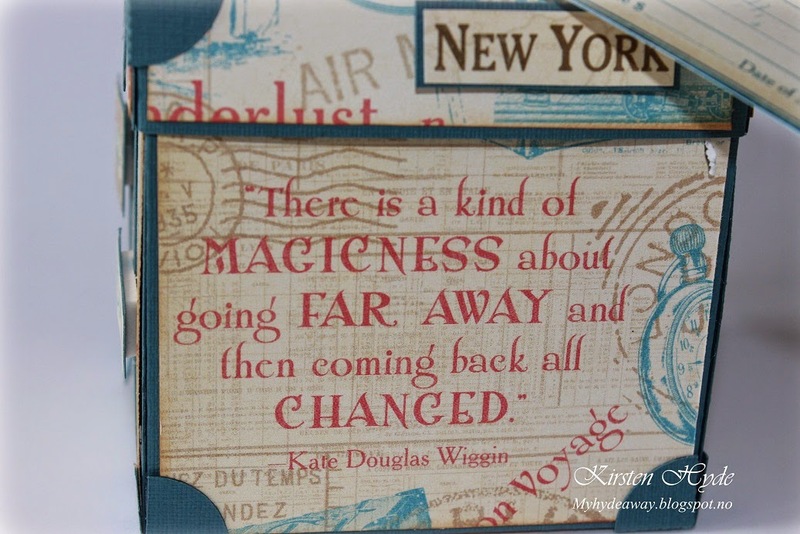 I have used gesso and distress ink and paint together with my own stencils, to create the background effects. 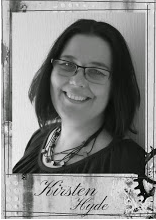 The black glitter gears are med with a Memory box dies and black glitter paper from Søstrene Grene. I wanted to do something different with the circle in the sketch given from Prima. 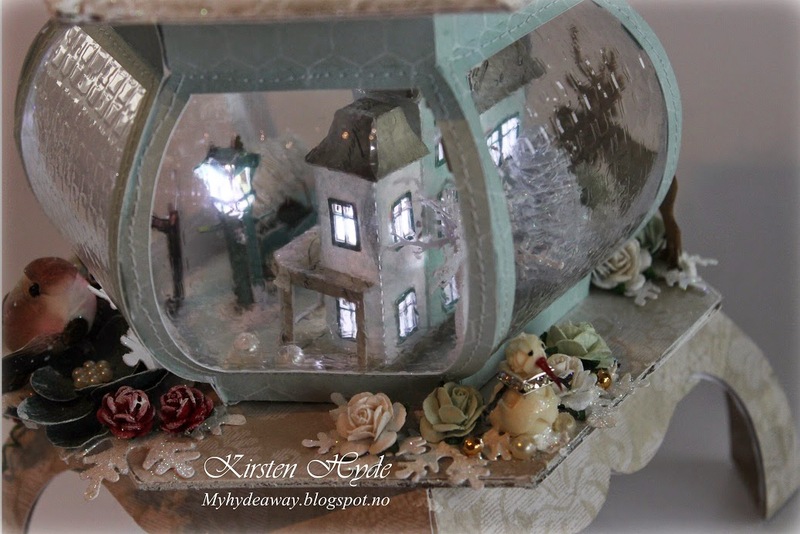 I used half of an acrylic Christmas ball and created a scene inside. I have used Prima's Junkyard Findings - Steampunk air- rotor blades together with some old metal, to create the miniature airships. The two photos are some steampunk photos taken a while ago. The stamps are from Indigo Blu, and the set is called B.F.F. I have used an old unused bandage as cheese cloth. 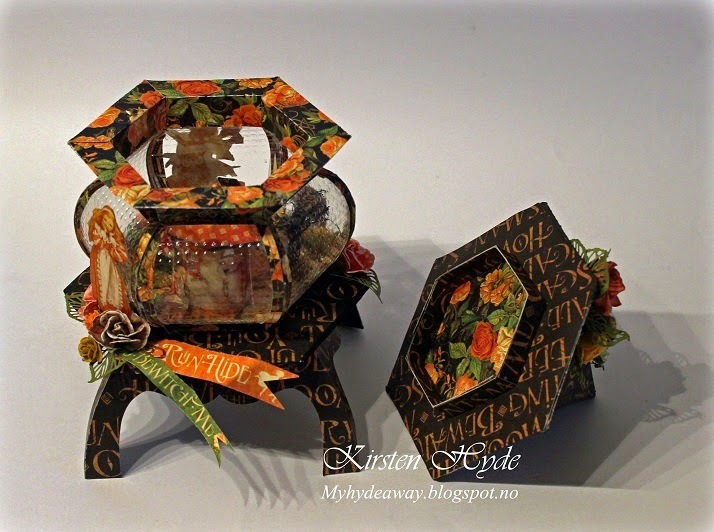 The diecuts are made with dies from Prima; Purple Metal Die - Leaves and and Lacy Flowers. I have also added some metal embellishments in between the flowers. 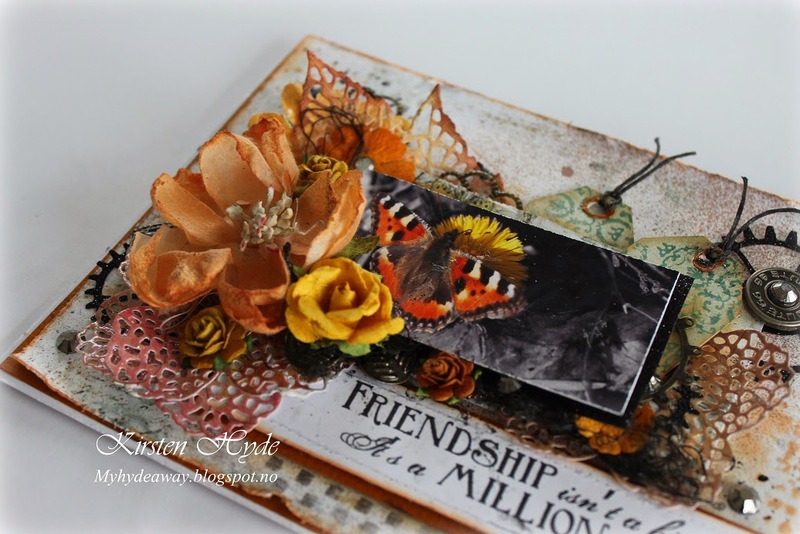 We have got some autumn inspiration for our new challenge at StampARTic. 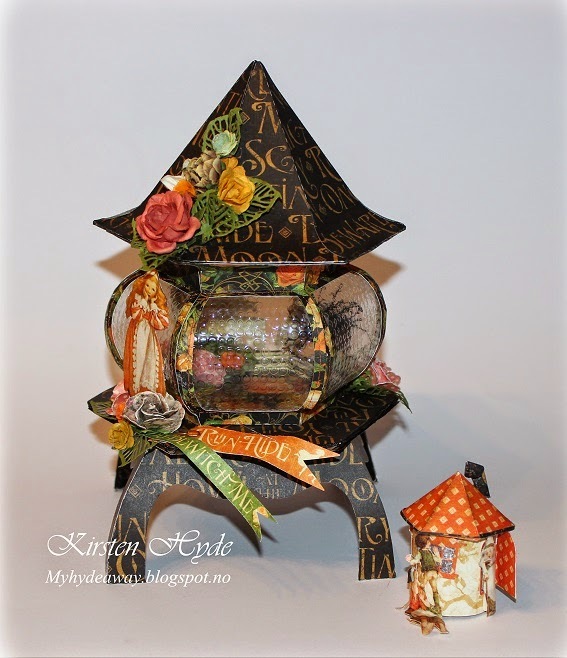 I have created a Graphic 45 lantern as my DT contribution. 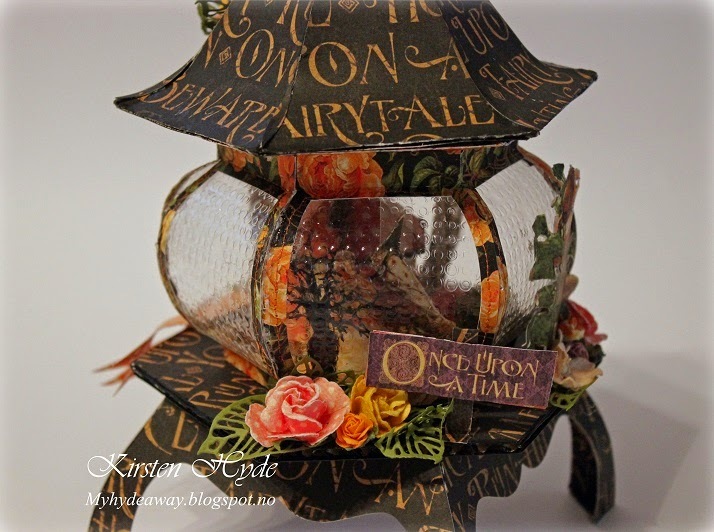 The lantern is made out of papers from An Eeri Tale collection from Graphic 45. 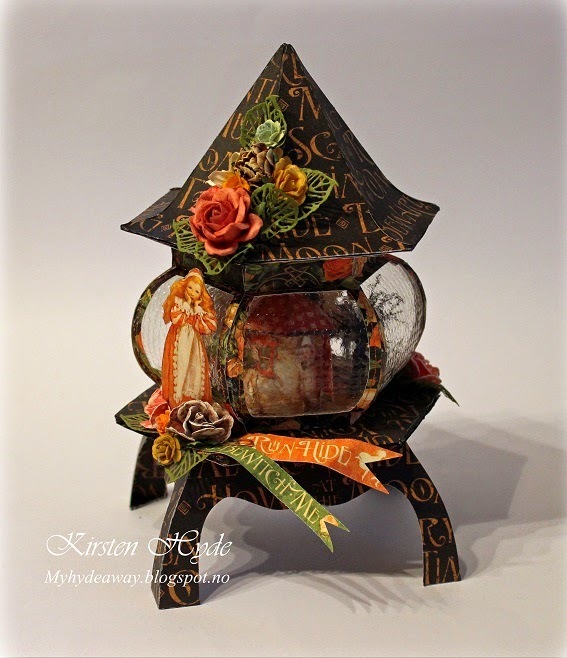 I have published tutorial and template for the lantern in an earlier post. The windows are made from embossed acetate. 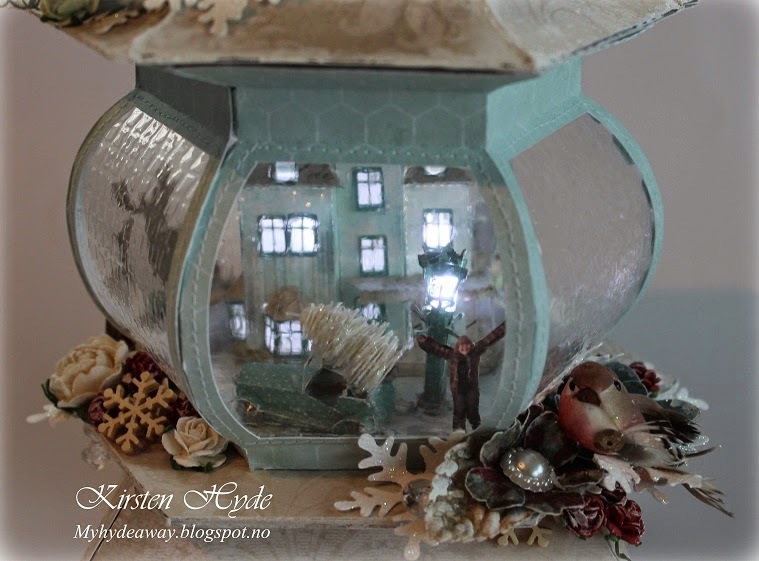 I have created a small Hans and Gretel scene inside the lantern. I have created a small witch house around an electrical tea light, creating some light inside the house. At the back of the lamp, there is Jack climbing the beanstalk looking into the lantern. There is also a small tree and a flying witch. Leaves are made from the new Prima Purple Metal Die - Leaves. Flowers are from Prime and Wild Orchid craft. 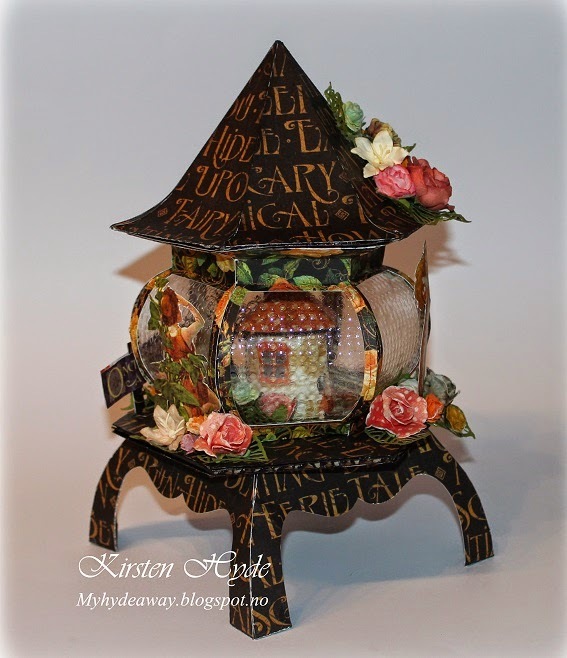 The top of the lantern can be taken of, revealing the Hans and Gretel scene inside. 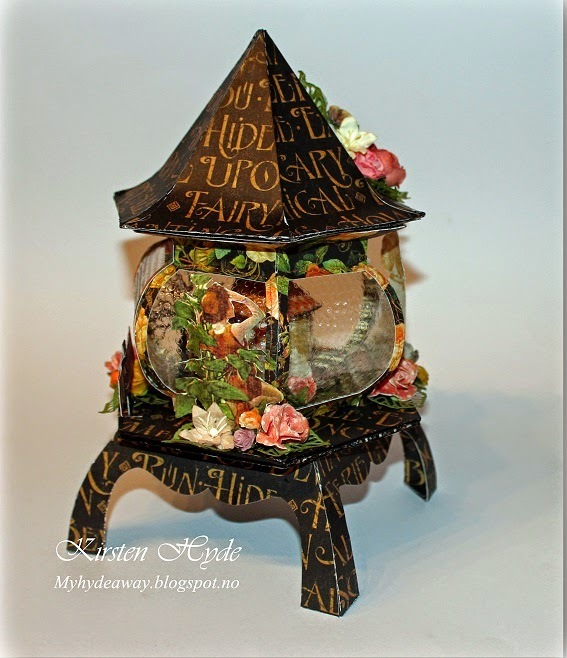 The lantern with the small witch house. Hans and Gretel looking inside the window in the witch house. The witch is walking out of the door in the house. Thank you for looking through my blog. I suddenly regretted it, since the challenge was to create a light house with Gunn-Eirill's cutting file INSIDE the tiny heart. What a challenge! 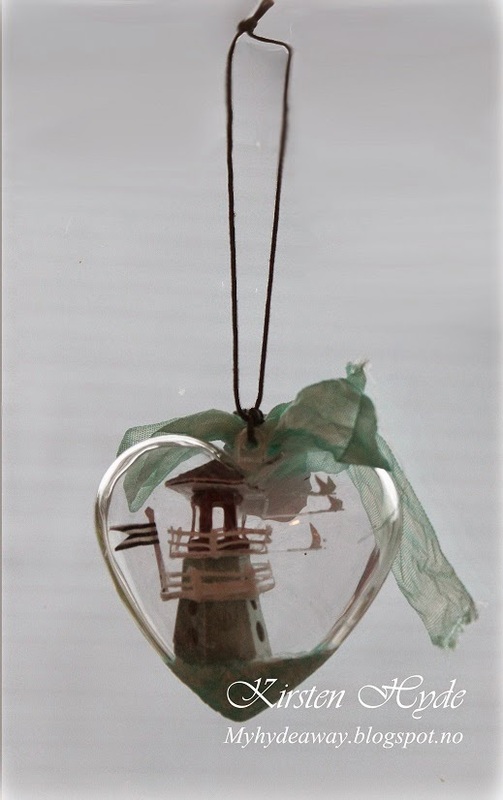 So, I took the challenge and here is the heart with the lighthouse inside. 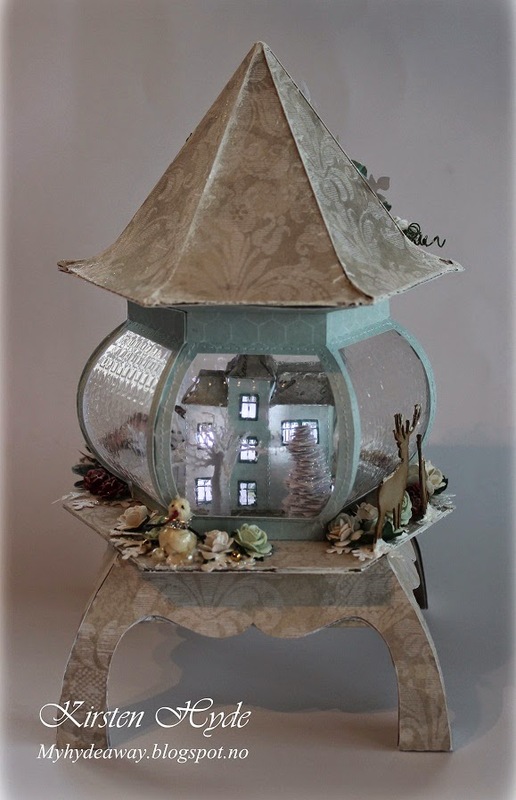 The lighthouse is 4 cm high, and it is made from Prima papers. 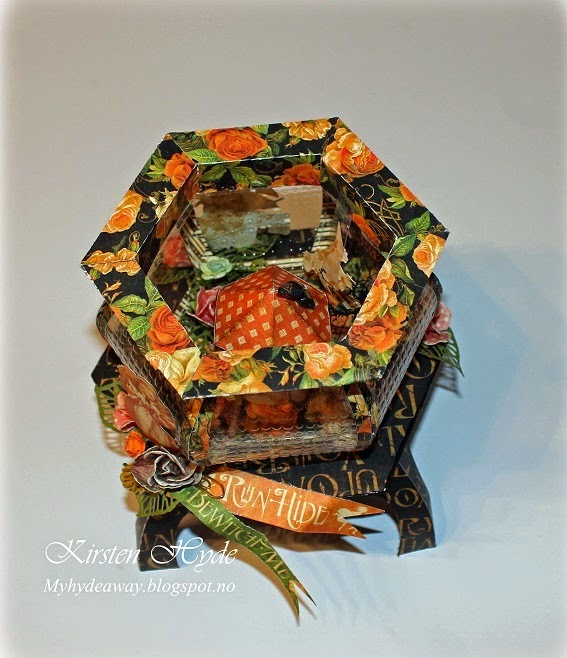 The ribbon is Tim Holtz Crincle Ribbon coloured with distress ink. 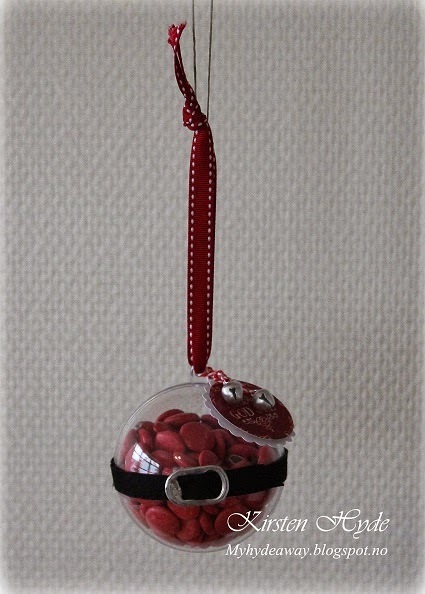 Here is the third little Christmas ornament made for Hobbykunst's stand for the craft fair, Stempelscrap. 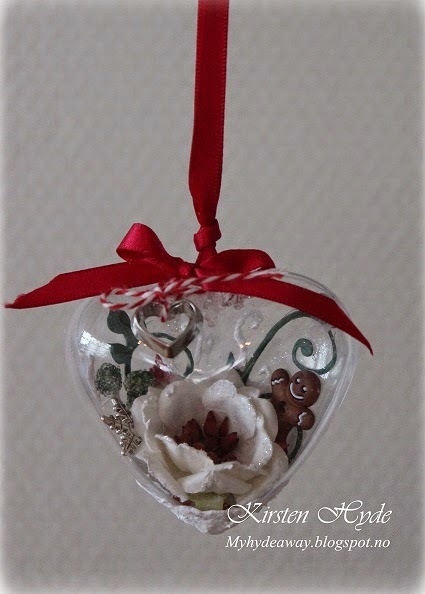 I have decorated this litte acrylic heart ornament with a flower, dies, a gingerbread button, snowflake charm and a gingerbread cookie cutter heart. This heart is only 6 cm wide, so it is tiny. These hearts are brilliant and simple to create with. ....make sure you come back to find out how it turned out later. 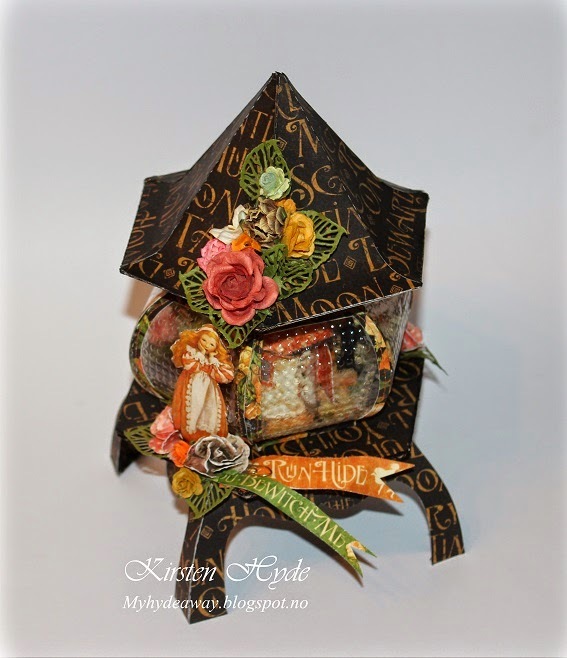 Here is the second little Christmas ornament made for Hobbykunst's stand for the craft fair, Stempelscrap. 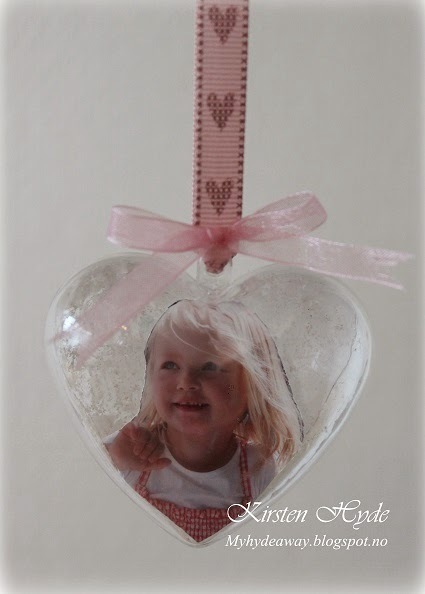 I got the task to create something simple out of this small cute acrylic heart ornament. This was made as an example as a super easy present, that a child also could make, perhaps with a little help. This is only 6 cm wide, so it is tiny. First, I added blanc glue to the inside of one of the halfs of the heart. Then I added glitter, and set it to dry. I coloured over the glitter with a white Triton acrylic marker. The glitter could now be seen from the outside, back of the heart with a white background behind it. Then I mounted an acrylic sheet inside the heart. I glued the photo to the acrylic sheet in the heart, and mounted the two half hearts together. 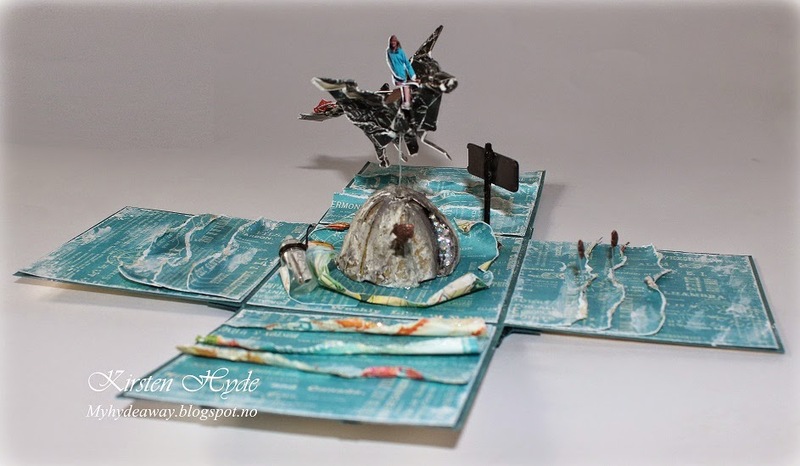 A few weeks ago, I helped Hobbykunst at the Stempelscrap craft fair. One of my tasks was to create some inspiration with the Acrylic ball ornaments. I have made rather complicated ornaments before, but this time, I wanted to create something that was easy to make. The idea came from another ornament I found online, somewhere, some time ago. The acrylic ball is filled with red "Non Stop" / Smarties. I have used a black ribbon around the ball, and a soda can tab as the belt buckle. I was going to make a card for a girl who likes travelling and the film "How to train your dragon". 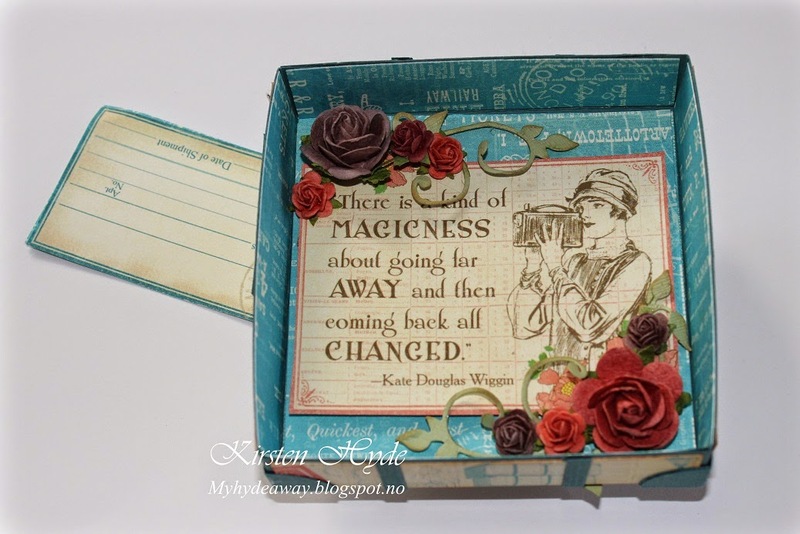 The result was a travel trunk with a flying origami dragon inside. 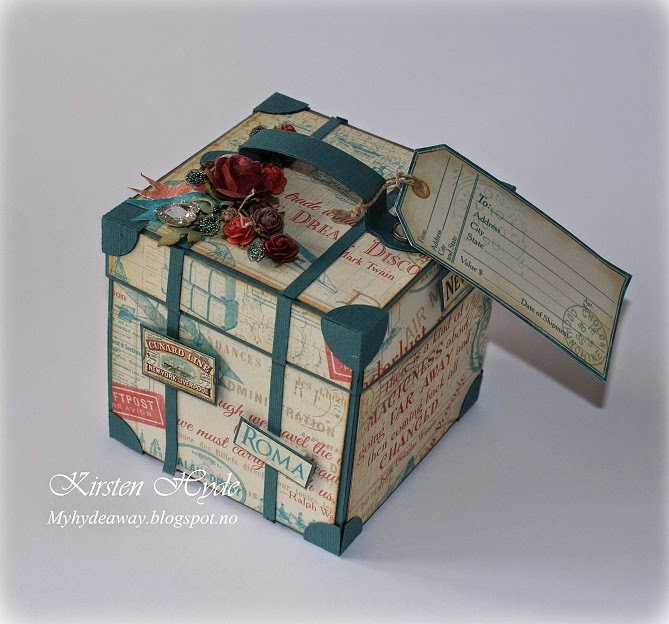 The travel trunk is made from Graphic 45 papers - "Come away with me" selection. It is made as an explosion box with a lid. 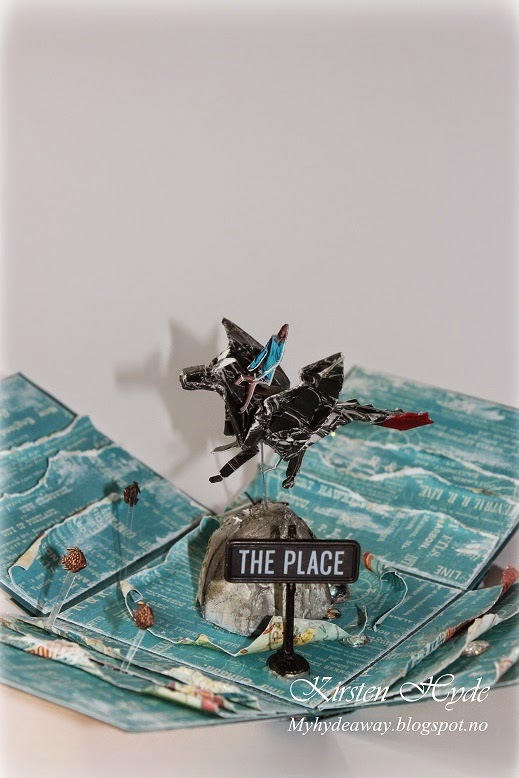 The box hides a scene with sea, a small mountain, and an origami dragon. The sign is from Prima. 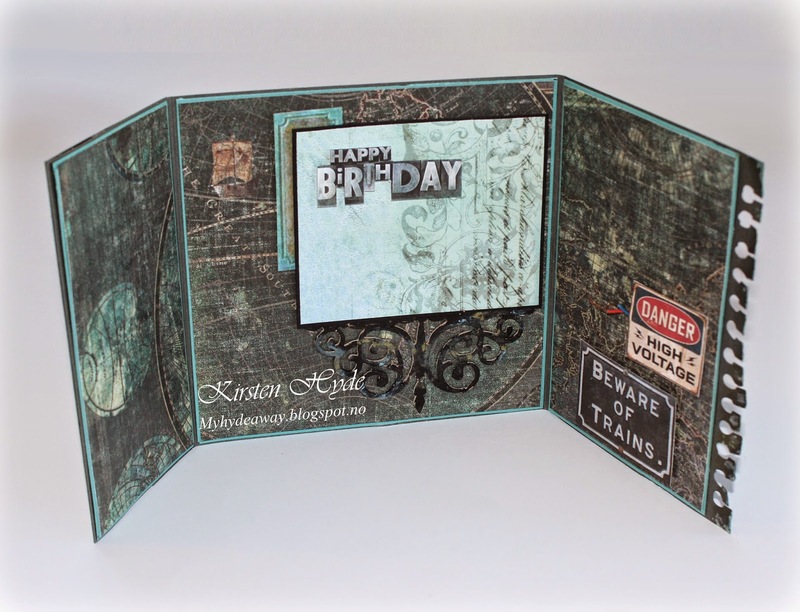 The patterned paper has been teared and curled to create the waves. The little mountain is made from half of a polystyrene egg. The egg is covered with paper and gesso, and then painted. I have also added "bling" with glitter in some of the cracks in the mountain. 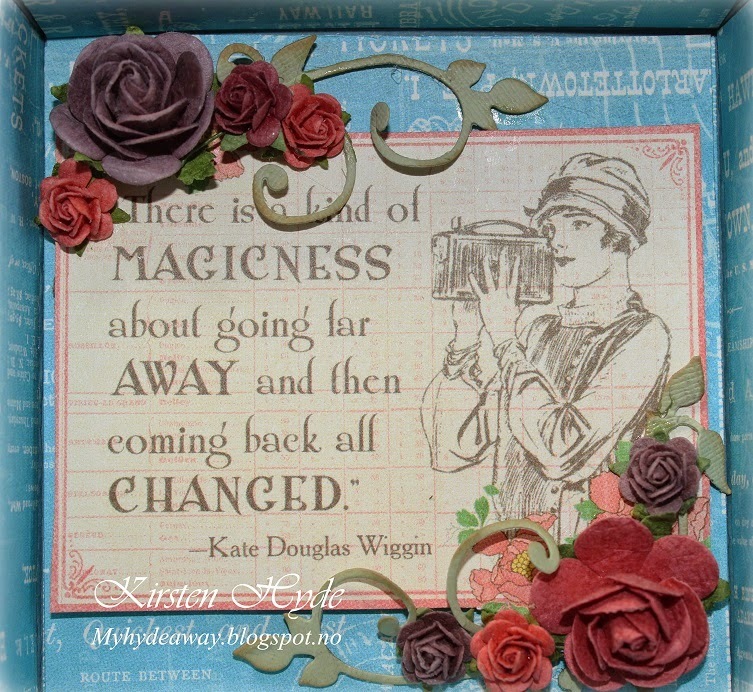 The outside of the lid. How to train your dragon- trailer. 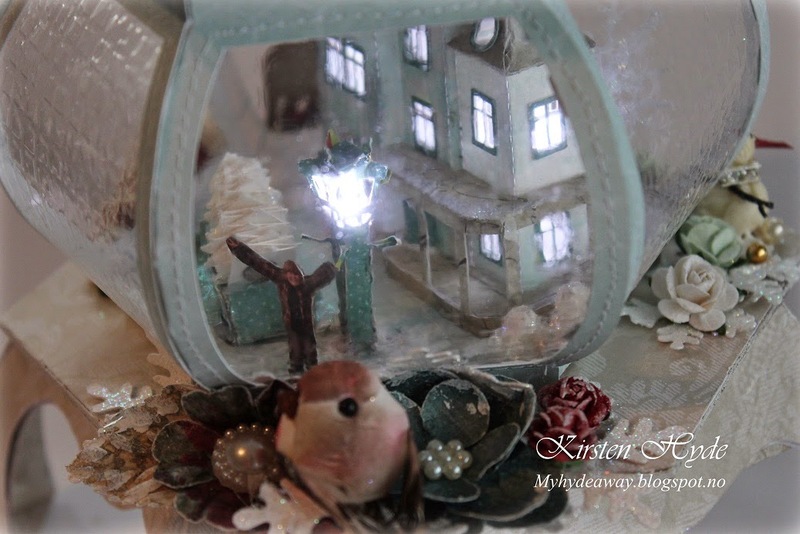 A few weeks ago, I created this vintage winter lamp. 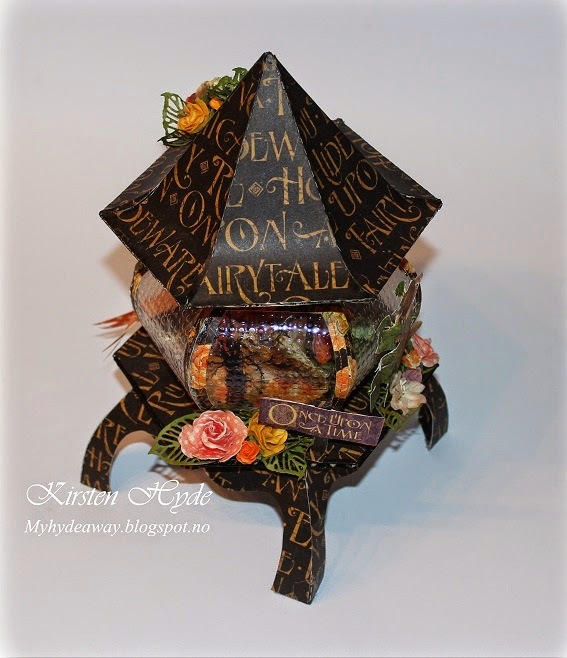 The lamp template and tutorial, is one I made and that was in print in the magazine, Ett trykk, a year ago. 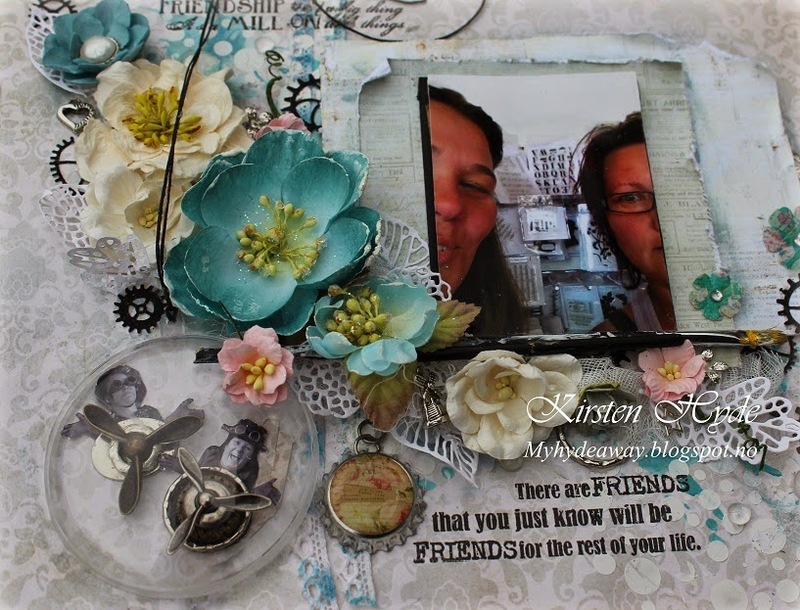 The papers are from Melissa Frances.Flowers are from WOC and Prima. 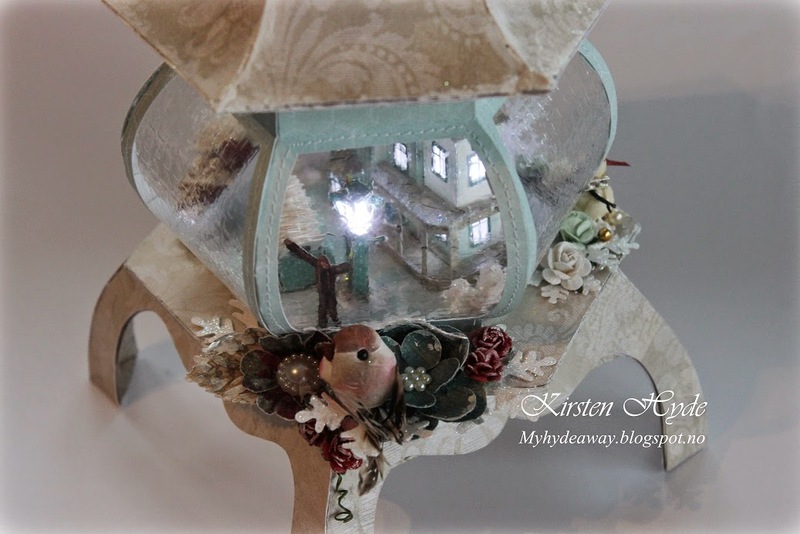 I have created a winter scene inside the lamp. 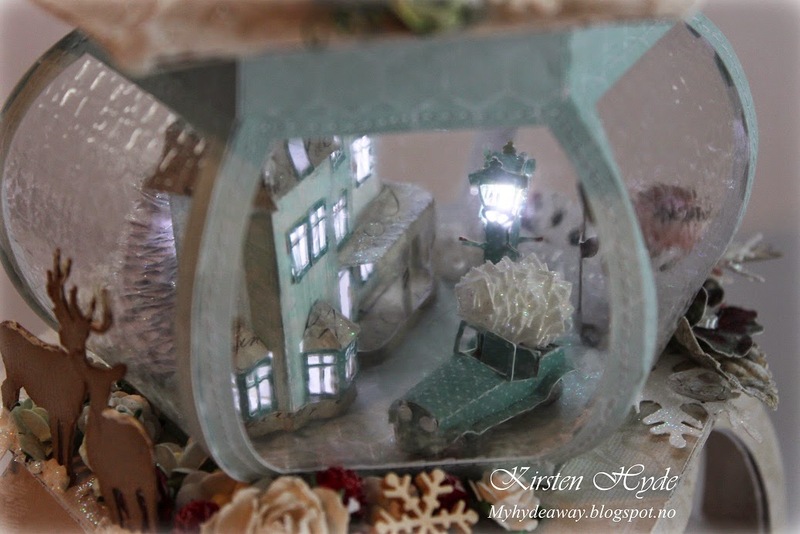 I have created a small house, a lamp post, a vintage car, trees and a photo of a girl inside the lamp. I have mounted led lights inside the house and inside the lamp post. The miniature vintage car is my own template. 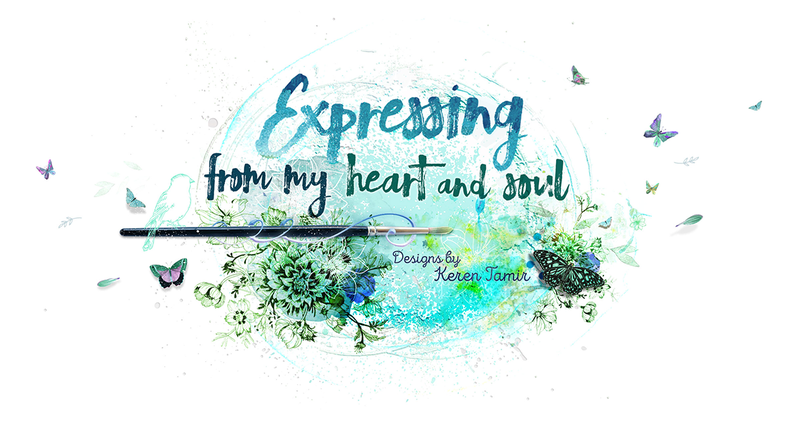 You can find the car template in my blog (or contact me by mail to get the silhouette studio file). The Elks are my own design, created from a photo I took last summer. 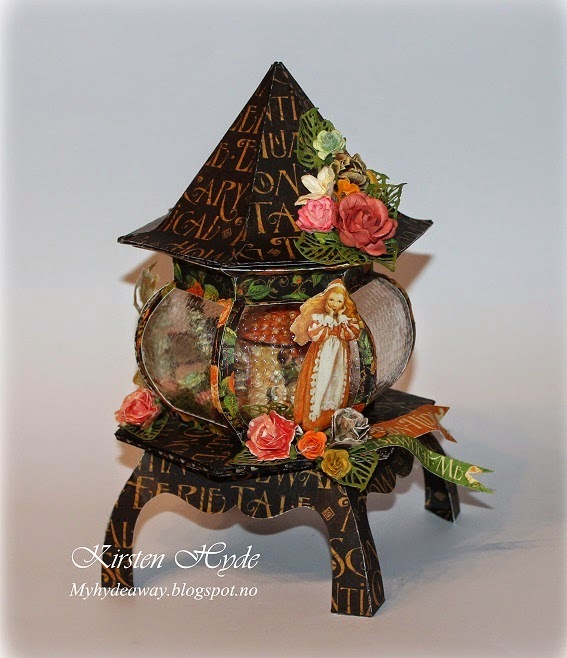 The bird is from Hobbykunst, and most of the flowers on the front are from Prima. The lamp post is a miniature of one I took a photo of in England. I have added two trees at the back of the house, one pine tree and one deciduous. I have added glitter for a frost effect on the trees. The little snowman is made from plastic pearls from an old bead necklace. The wires and the battery are hidden under the lamp. I have also mounted a switch to turn on the lights. 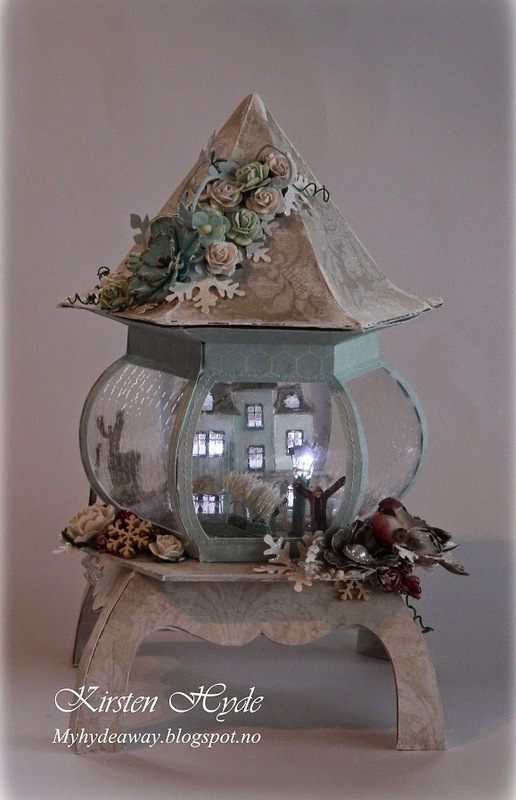 The roof of the lamp has been decorated with flowers from Prima and WOC. I have also made a short film to show the lamp and all the features. 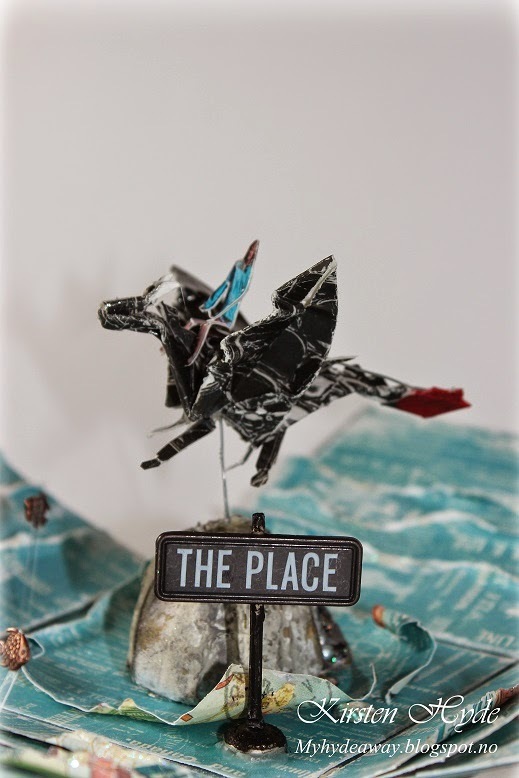 We are showing you Mixed Media projects at StampARTic today. 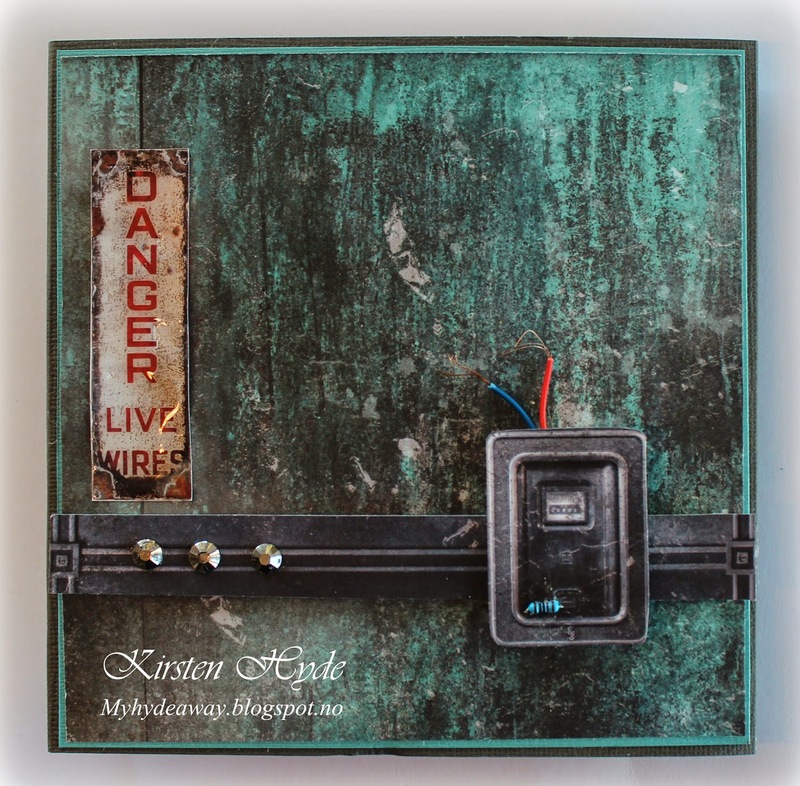 Mixed Media is an art form, where you use a lot of different types of medias to create a finished product. Paper, plastic, metal and flowers are often used. Paint, stains and sprays are used to colour the background and the different medias to create shadows and different effects. 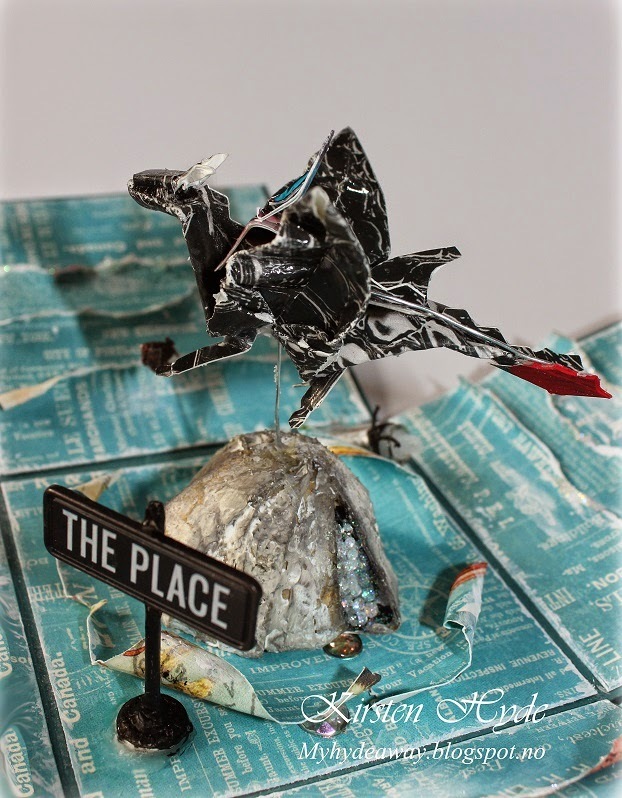 There are a lot of different paperartists who create Mixed Media. Two of them are Aida Domisiewicz og Anna Dabrowska (Finnabair). 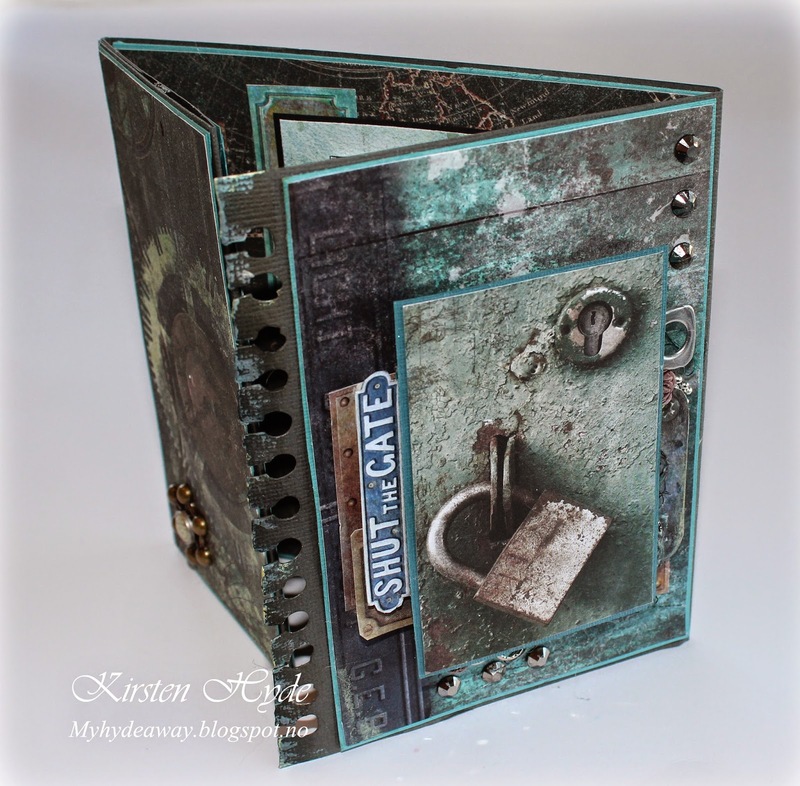 I have created a Mixed Media Journal page. 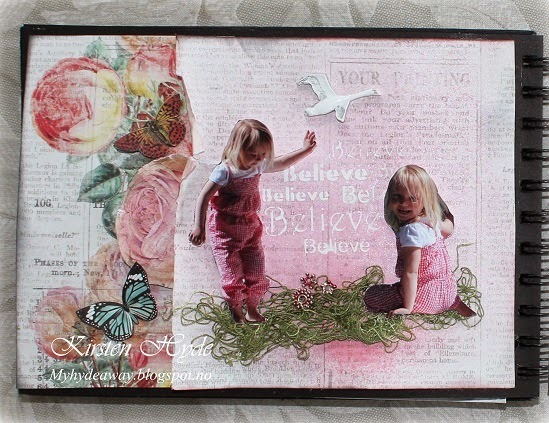 Papers and some of the embellishments are mostly from Prima. 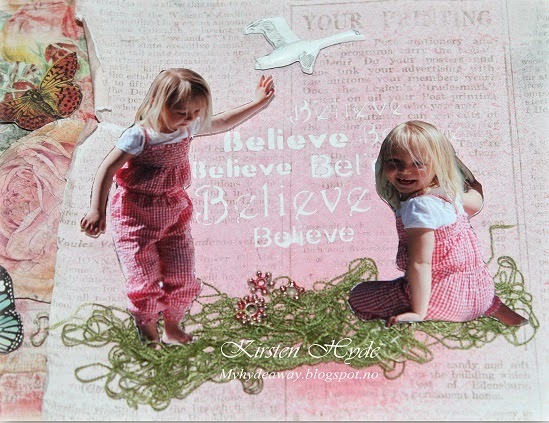 Prima is also challenging crafters to "Think Pink" this month - so I did. 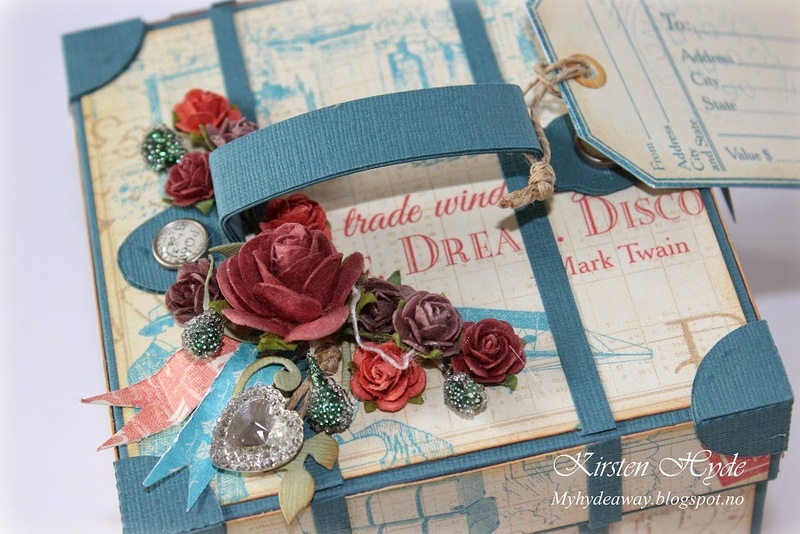 The background paper is from Prima - Something Blue Collection. 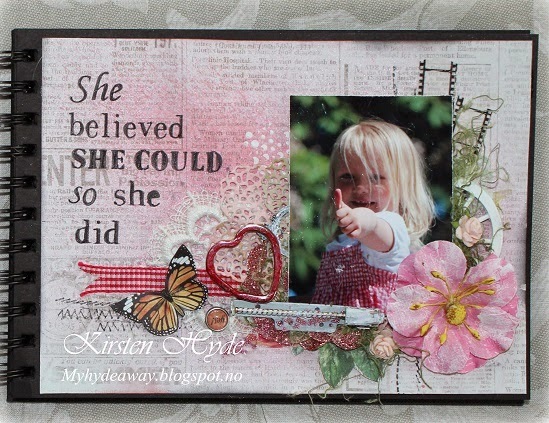 I have used dilution sprays on the background, and created background effects in the paper with my own stencils and gesso. The metal has been coloured with Triton acrylic markers (acrylic paint in a marker). 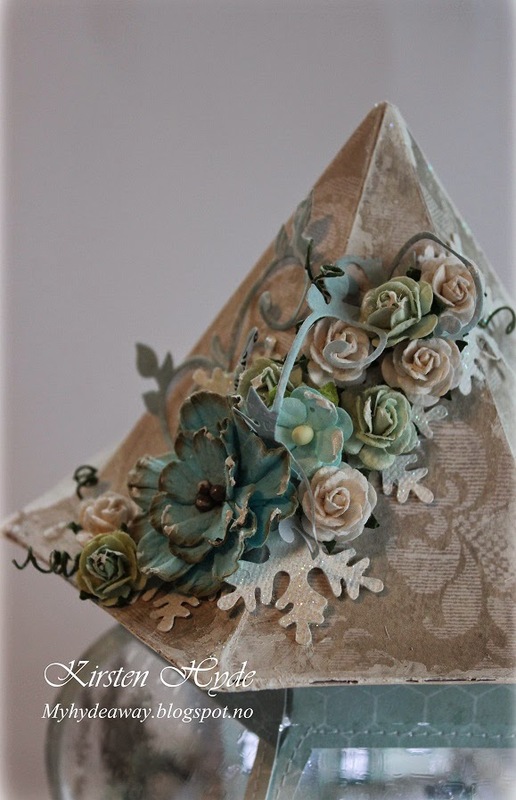 I have also tested Primas new leaves- and lacy flower- dies. The grass is made from polishing wool for cars, coloured with alcohol ink. I use RX glue for most of the papers, polishing wool and ribbon and lace. 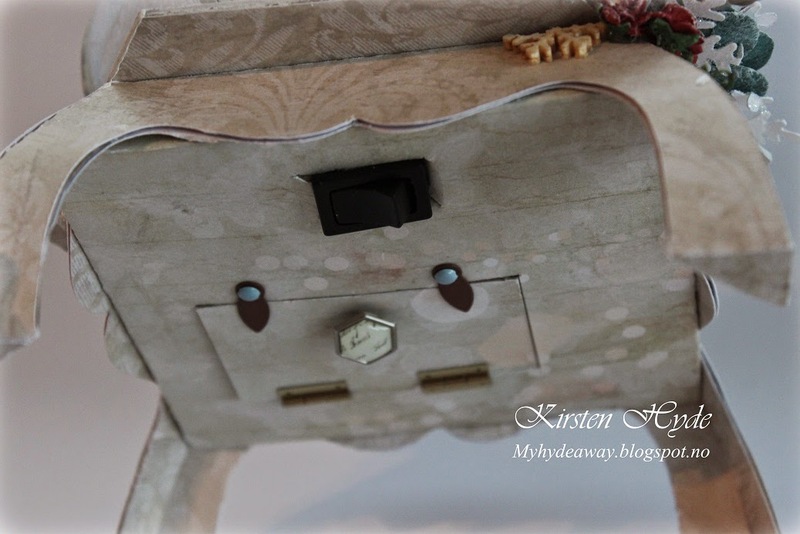 I use Matte Super Heavy Gel (Liquitex) for the metal ands some of the embellishments. 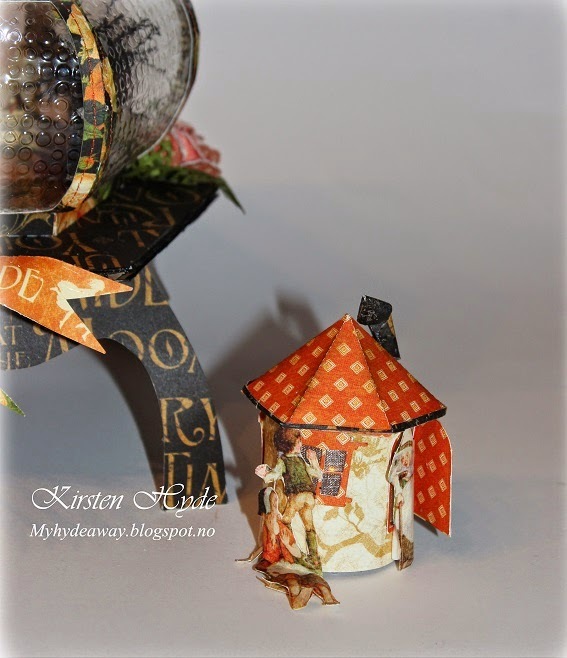 We have a new challenge at Scandinavia paper fun. This time, it is masculine cards. I have used papers from Studio light - Industrial, Industrial photos special and Industrial Photos 1. 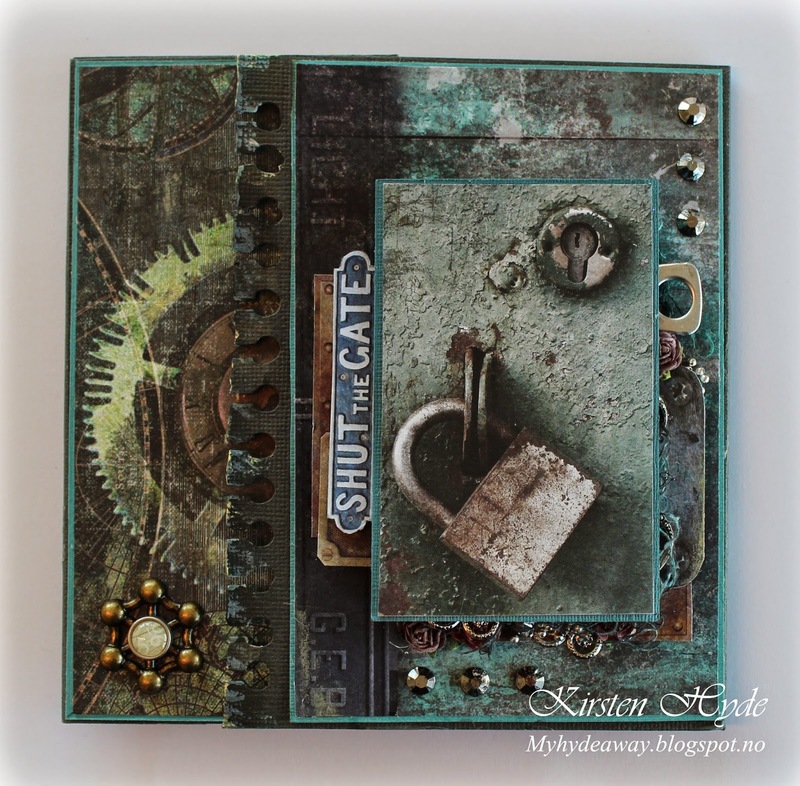 I have also used a bit of Mixed Media to create effects. Some of the metal has been coloured with Triton Acrylic markers. I have also used some cotton, sticking our from under the lock image, and coloured it with distress ink. 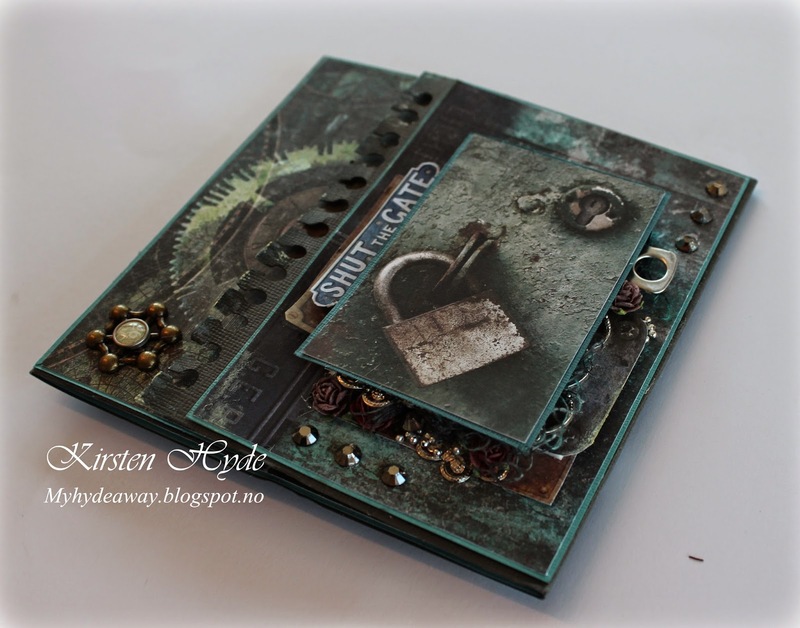 The edge of the card has been diesed with a Tim Holtz edge dies. The card locks with a magnet. 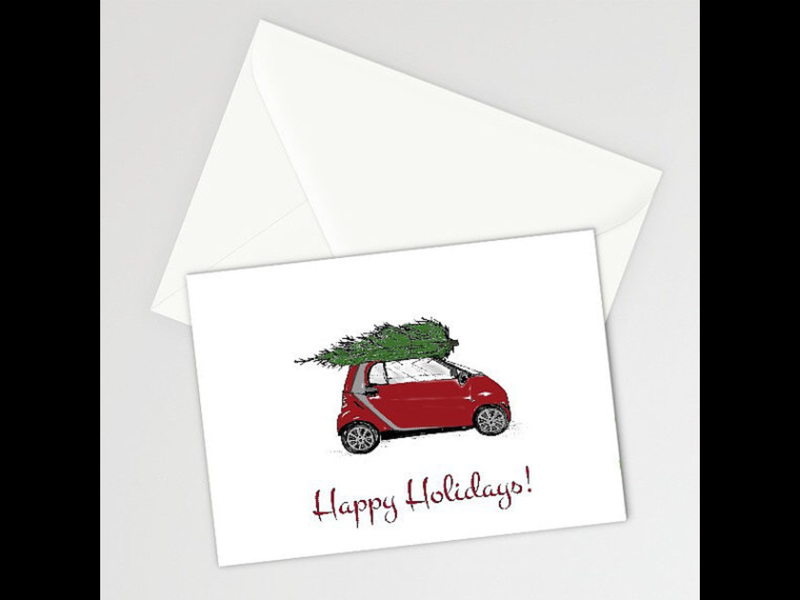 The card is decorated inside. 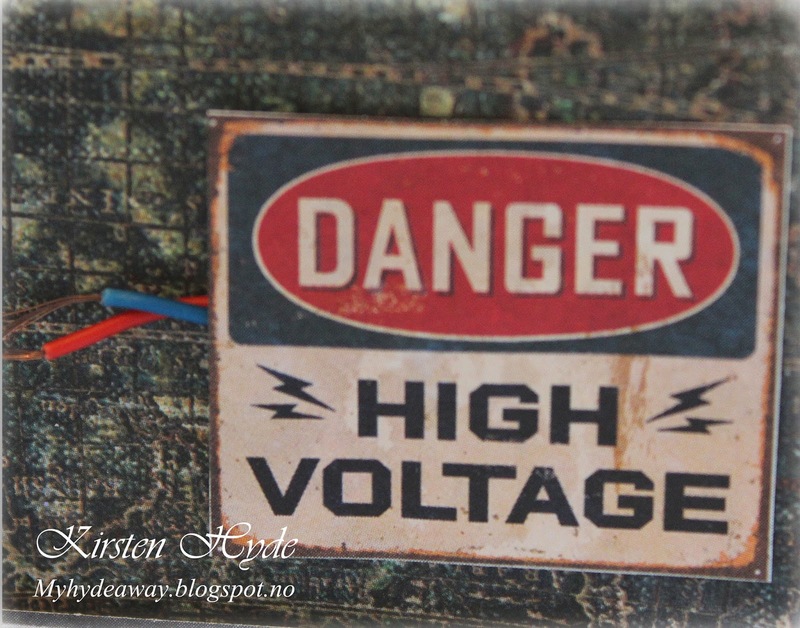 I have used the motives from the cardstock on the back, but added a few electrical features.